Are Standing Room Only Flights on the Horizon? Airbus patent could mean stand up seats on planes! You better sit down for this one. 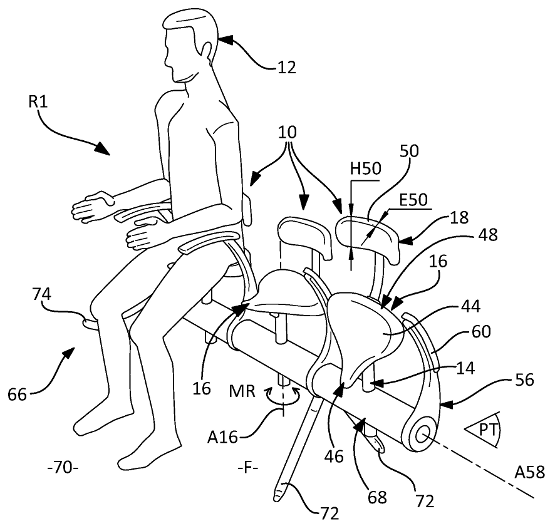 A search on U.S. Patent and Trademark Office confirms that Airbus has filed a patent for a "seating device comprising a forward-foldable backrest". The seating devices, a.k.a. vertical seats, are being touted as the next best thing in discount air travel. They would essentially create passenger cabins that are standing room only, allowing airlines to fit more travelers into a fixed space and purportedly passing the money-saving benefits on to passengers. A study published in the August, 2014 edition of the International Journal of Engineering and Technology, by aerospace engineer Dr. Fairuz Romli supports the feasibility of creating standing sections in cabins for low-cost airlines to make them more competitive in the general travel industry. The study suggests that these airlines could fit 21% more passengers in a cabin, enabling them to reduce ticket prices by 44%, making them competitive not only with larger airlines, but with buses and trains as well. The proposed vertical seating device in the Airbus patent resembles a bicycle seat with armrests and a lower lumbar backrest. The patent rates the comfort level as "tolerable" if the flights are of short duration. Romli's study concludes that the vertical seat idea could be effectively used to reduce operational costs that could be passed on to passengers, but the study also reveals that the greatest savings for the airlines would be on longer flights. In his study, Romli introduces other futuristic vertical seating designs including one that features the passengers fully standing while harnessed to a backrest for safety. He points out that comfort is not standardized in air travel. "Air Transport Association (ATA) does not officially impose any specific standards for the seat comfort or seating configuration. " Therefore, the door is open to the possibility of vertical seats, and he believes that the appeal of low-cost air travel would outweigh the importance of comfort for many passengers. Maybe you're wondering about the safety of standing in an airliner with a cruising speed of 550 mph, after all who hasn't been ordered back to their seat when the flight hits turbulence? According to the study, Romli has no concerns about possible safety objections from the FAA, who he says hasn't outlawed standing seats in its current aviation standards. "For instance, Federal Aviation Authority (FAA) does not enforce that the passenger must be in a sitting position during both takeoff and landing procedure, as long as the passenger has been properly secured." Airlines have already swapped out passenger seats for smaller, lighter versions, reaching the place where they cannot reduce the per seat space any further, and making room for the idea of standup seating. Romli admits that the FAA and the ATA may indeed balk at the concept when airlines are ready to implement it, and present regulatory obstacles to be overcome, but at this point he is saying it's feasible; it's possible; it's a realistic option. There is still the question of marketability. When Ryanair entertained the possibility of vertical seats a few years ago with the introduction of SkyRider, a first generation vertical seat design, they eventually abandoned the concept, believing it was an idea whose time had not yet come. The market wasn't ready then, but maybe it is now. Watch the video below to hear what RyanAir's CEO Michael O'Leary said about having passengers stand up on flights. What do you think? If the price were right, would you give up the comfort of an airplane seat for standup seating?